If you can't control your emotions, you can forget about leading a debt free life. Staying debt free is an art. The one who learns this art fast can lead a happy financial life and the one who doesn't is doomed to lifelong miseries. 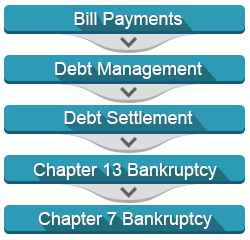 OVLG helps you in becoming a debt free man through its much talked about Waterfall approach to debt free™ life. This approach is very unique as it helps you select the right solution on the basis of your financial and debt situation. Like it has been said, Waterfall approach to debt free™ life gives you the best solution as per your financial health and debt situation. Find out how it works and helps you choose the right debt free option. Selected the debt free solution that works best in your current financial situation? Good. Now click on the solution on which you want to get help from OVLG. So you want to have a life free of debt? But, what kind of habits should you practice every day? Find out on your own. How can a person maintain a debt-free life? What similarities do the debt free Americans have? Eager to get debt free?